I don’t know about you, but when I have a big decision to make, especially one that involves a bunch of pressure, its not always easy to know which way to go. And I hear from you guys all the time that it can be really hard to know when you’re feeling a bit split inside with your list of pros and cons. We can sort through all the options and get a short list, but then it can be tricky to find the best option from that short list. So that’s when I suggest we need to step away for a bit to get some clarity. Personally, I will want to review my choices to sense if there is any compromise subtly coming in. I never want to be navigating from compromise, but it is so habitual in our culture, and so deep a groove in our thinking, that compromise can subtly come in and steal all the joy, all the possibility, and all the fulfillment. Its a sneaky bugger, but you can tell when its around because you feel a squirmy sense of depletion or frustration inside. We have all been raised on compromise, it is agency for our separate self. It is how separate self gets power, and well, generally gets around town. But do you know when it shows up? And do you know about its consequences? And most importantly, do you know there is an option? Compromise: Subtle to obtuse sense of depletion, depression, and/or frustration. Masks itself as surrender and feels like affirmative spiritual action for the do-good-er in us all. Consequences: Blocks our access to the limitless possibility of reality. I could go on, but do I need to say more?! Option: Consensus and clarity, noticeable as subtle to obtuse sense of exhalation and ease. So when we take a moment to consider the choices in front of us, we want to hear what clarity has to say, and sometimes its hard to be willing to listen. Its hard to hear clarity if it is sending us towards bigger unknowns. 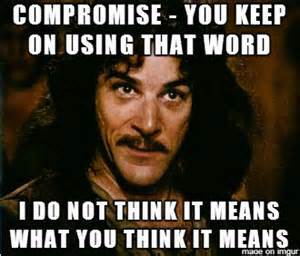 Whereas compromise might feel like a sure thing. I.E) Even though its clear I don’t want to work with this Realtor, I don’t know another who is going to write off my closing costs. So, I could just compromise and work with this person because this house is not going to stay on the market for long, or I can listen to clarity and sit deeper in the unknowns….What to do? Now the reason I want to suggest you lean over to the clarity side of the fence is because I know reality really well, and I know there are no missed opportunities. I know there is no such thing as lack and limitation, not in reality. I know that fear will tell you all kinds of lies and fish stories all day long until your scared to even breathe. And I know if you can avoid falling for it, you will put yourself in a position for the magic of limitless possibility that is your birth right. The clarity, if your willing to listen, will lead you directly towards freedom, connection, and fulfillment. So, bottom line, to make a big decision easy you will need to be willing to hear the lack and compromise sneaking in, and willing to hear clarity. Then you will need the courage to choose clarity. And the more you do this, the more you will notice how much possibility, joy, fulfillment and freedom is truly available to you.